Michigan basement foundation does not go down to 6 ft floor. Considering buying property but would like to have an estimate to repair before making an offer. Section of garage floor sunk and section of apron just outside of garage door sunk as well. Also section of garage floor in second garage floor sunk as well. Need estimate on approx 20ft of sidewalk raised and 2 driveway slabs. Thank you for your time. Cracks forming in basement cement wall, house was built in 1972. I need a crack in my poured concrete basement foundation wall sealed up asap. To waterproof a basement is it necessary to dig outside the foundation? Paul & Trena H. Bates St. Standing water in this MI basement eventually allowed mold to grow. Does your basement flood after a heavy rain? Or have you noticed water seeping in through a wall crack or around a basement window? There are many ways for water to get into your basement, but there's only one way to get it back out - Ayers Basement Systems! In business since 1981, Ayers Basement Systems has the skills and tools required to successfully waterproof your wet basement. We have thousands of happy customers who trust us to keep their homes safe and dry with the latest technology designed for basements. We know we can help you too! Have you noticed any of these signs of basement water problems in your home? Getting rid of moisture sooner rather than later is always a good idea because the longer you have water or humidity in your basement, the more likely it is that mold or rot will grow. The structure and air quality of your home will be negatively affected, and you won't be able to use the space for storage or any other purpose. And, if you want to sell your home in the future, you'll have to resolve these issues first - but it'll cost more then than it will now. 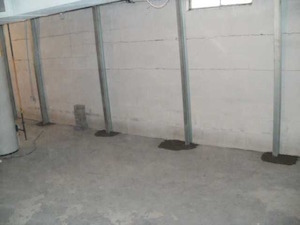 Ayers Basement Systems uses a line of Basement Systems waterproofing products to restore your basement and keep it dry. We have high-volume sump pumps, French drains, and efficient dehumidifiers to remove water and humidity from your basement. We also offer basement wall and flooring options to make your basement a nicer space, and other additional products include water heater protection rings, durable washer hoses, window wells, and much more. Basements aren't the only part of the house that need protection from moisture. Crawl spaces are easy to forget because we don't usually need to visit them, but they are even more susceptible to the weather outside. Cold air in the crawl space can make the rest of your home uncomfortable. Water or humidity will lead to mold and rot that will harm the overall structural stability of your home. Ayers Basement Systems can encapsulate your crawl space using a proven crawl space vapor barrier that is resistant to mold. 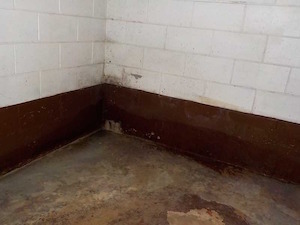 We also have drainage matting and a crawl space sump pump and dehumidifier to completely dry out this space. These products are designed to fit in the smaller area of a crawl space. Not sure whether your crawl space is in need of repair? The experts at Ayers Basement Systems can let you know when we come to your home for your free estimate! Wall braces help to support and straighten bowing walls. A sturdy foundation is a crucial part of any home. But you can't always be sure that the soil around your property is up to the task. Certain types of soil absorb more water than others, meaning that they can expand and shrink and cause issues like foundation settlement. If your foundation is shifting, or if you're experiencing another foundation issue, Ayers Basement Systems's foundation repair specialists can help! Using foundation piers, wall braces, and other foundation repair products, we can offer stability and security to your home once again. We also specialize in concrete lifting and leveling to fix cracks and bumps in your driveway, sidewalk, or garage using PolyLevel. Our methods of foundation repair and concrete leveling are much less disruptive to your property than traditional techniques, meaning you'll suffer less hassle than you would with another contractor. If you're concerned about your foundation, basement, or crawl space, Ayers Basement Systems is here to help. As a local, family-owned and operated company, we care about our customers and always strive for complete satisfaction. We don't want you to live in a wet or structurally damaged home, and we have the services required to keep you safe. Schedule a free estimate in Grass Lake, MI today!